A path is described using the concept of a current point. In an analogy with drawing on paper, the current point can be thought of as the location of the pen. The position of the pen can be changed, and the outline of a shape (open or closed) can be traced by dragging the pen in either straight lines or curves. Paths represent the geometry of the outline of an object, defined in terms of moveto (set a new current point), lineto (draw a straight line), curveto (draw a curve using a cubic Bézier), arc (elliptical or circular arc) and closepath (close the current shape by drawing a line to the last moveto) elements. Compound paths (i.e., a path with subpaths, each consisting of a single moveto followed by one or more line or curve operations) are possible to allow effects such as "donut holes" in objects. This chapter describes the syntax, behavior and DOM interfaces for SVG paths. Various implementation notes for SVG paths can be found in 'path' element implementation notes and Elliptical arc implementation notes. A path is defined in SVG using the 'path' element. The definition of the outline of a shape. See Path data. Animatable: yes. Path data animation is only possible when each path data specification within an animation specification has exactly the same list of path data commands as the d attribute. If an animation is specified and the list of path data commands is not the same, then the animation specification is in error (see Error Processing). The animation engine interpolates each parameter to each path data command separately based on the attributes to the given animation element. Flags and booleans are interpolated as fractions between zero and one, with any non-zero value considered to be a value of one/true. The author's computation of the total length of the path, in user units. This value is used to calibrate the user agent's own distance-along-a-path calculations with that of the author. The user agent will scale all distance-along-a-path computations by the ratio of pathLength to the user agent's own computed value for total path length. pathLength potentially affects calculations for text on a path, motion animation and various stroke operations. A negative value is an error (see Error processing). %stdAttrs;, %langSpaceAttrs;, class, transform, %graphicsElementEvents;, %testAttrs;, externalResourcesRequired, style, %PresentationAttributes-FillStroke; %PresentationAttributes-Graphics; %PresentationAttributes-Markers;. A path is defined by including a 'path' element which contains a d="(path data)" attribute, where the d attribute contains the moveto, line, curve (both cubic and quadratic Béziers), arc and closepath instructions. 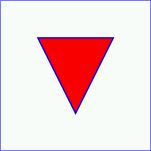 Example triangle01 specifies a path in the shape of a triangle. (The M indicates a moveto, the L's indicate lineto's, and the z indicates a closepath). <!DOCTYPE svg PUBLIC "-//W3C//DTD SVG 20001102//EN"
<rect x="1" y="1" width="398" height="398"
<path d="M 100 100 L 300 100 L 200 300 z"
Path data values can contain newline characters and thus can be broken up into multiple lines to improve readability. Because of line length limitations with certain related tools, it is recommended that SVG generators split long path data strings across multiple lines, with each line not exceeding 255 characters. Also note that newline characters are only allowed at certain places within a path data value. The following sections list the commands. m (relative) moveto (x y)+ Start a new sub-path at the given (x,y) coordinate. M (uppercase) indicates that absolute coordinates will follow; m (lowercase) indicates that relative coordinates will follow. If a relative moveto (m) appears as the first element of the path, then it is treated as a pair of absolute coordinates. If a moveto is followed by multiple pairs of coordinates, the subsequent pairs are treated as implicit lineto commands. z closepath (none) Close the current subpath by drawing a straight line from the current point to current subpath's most recent starting point (usually, the most recent moveto point). l (relative) lineto (x y)+ Draw a line from the current point to the given (x,y) coordinate which becomes the new current point. L (uppercase) indicates that absolute coordinates will follow; l (lowercase) indicates that relative coordinates will follow. A number of coordinates pairs may be specified to draw a polyline. At the end of the command, the new current point is set to the final set of coordinates provided. h (relative) horizontal lineto x+ Draws a horizontal line from the current point (cpx, cpy) to (x, cpy). H (uppercase) indicates that absolute coordinates will follow; h (lowercase) indicates that relative coordinates will follow. Multiple x values can be provided (although usually this doesn't make sense). At the end of the command, the new current point becomes (x, cpy) for the final value of x.
v (relative) vertical lineto y+ Draws a vertical line from the current point (cpx, cpy) to (cpx, y). V (uppercase) indicates that absolute coordinates will follow; v (lowercase) indicates that relative coordinates will follow. Multiple y values can be provided (although usually this doesn't make sense). At the end of the command, the new current point becomes (cpx, y) for the final value of y.
Cubic Bézier commands (C, c, S and s). A cubic Bézier segment is defined by a start point, an end point, and two control points. Quadratic Bézier commands (Q, q, T and T). A quadratic Bézier segment is defined by a start point, an end point, and one control point. Elliptical arc commands (A and a). An elliptical arc segment draws a segment of an ellipse. c (relative) curveto (x1 y1 x2 y2 x y)+ Draws a cubic Bézier curve from the current point to (x,y) using (x1,y1) as the control point at the beginning of the curve and (x2,y2) as the control point at the end of the curve. C (uppercase) indicates that absolute coordinates will follow; c (lowercase) indicates that relative coordinates will follow. Multiple sets of coordinates may be specified to draw a polybezier. At the end of the command, the new current point becomes the final (x,y) coordinate pair used in the polybezier. s (relative) shorthand/smooth curveto (x2 y2 x y)+ Draws a cubic Bézier curve from the current point to (x,y). The first control point is assumed to be the reflection of the second control point on the previous command relative to the current point. (If there is no previous command or if the previous command was not an C, c, S or s, assume the first control point is coincident with the current point.) 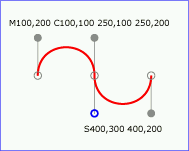 (x2,y2) is the second control point (i.e., the control point at the end of the curve). S (uppercase) indicates that absolute coordinates will follow; s (lowercase) indicates that relative coordinates will follow. Multiple sets of coordinates may be specified to draw a polybezier. At the end of the command, the new current point becomes the final (x,y) coordinate pair used in the polybezier. Example cubic01 shows some simple uses of cubic Bézier commands within a path. Note that the control point for the "S" command is computed automatically as the reflection of the control point for the previous "C" command relative to the start point of the "S" command. The following picture shows some how cubic Bézier curves change their shape depending on the position of the control points. 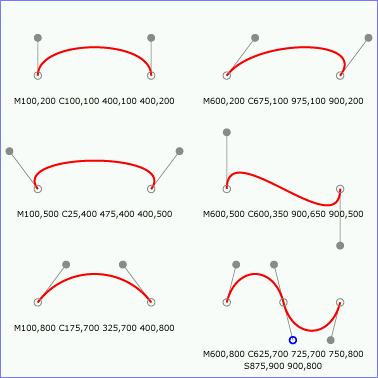 The first five examples illustrate a single cubic Bézier path segment. The example at the lower right shows a "C" command followed by an "S" command. q (relative) quadratic Bézier curveto (x1 y1 x y)+ Draws a quadratic Bézier curve from the current point to (x,y) using (x1,y1) as the control point. Q (uppercase) indicates that absolute coordinates will follow; q (lowercase) indicates that relative coordinates will follow. Multiple sets of coordinates may be specified to draw a polybezier. At the end of the command, the new current point becomes the final (x,y) coordinate pair used in the polybezier. t (relative) Shorthand/smooth quadratic Bézier curveto (x y)+ Draws a quadratic Bézier curve from the current point to (x,y). The control point is assumed to be the reflection of the control point on the previous command relative to the current point. (If there is no previous command or if the previous command was not a Q, q, T or t, assume the control point is coincident with the current point.) T (uppercase) indicates that absolute coordinates will follow; t (lowercase) indicates that relative coordinates will follow. At the end of the command, the new current point becomes the final (x,y) coordinate pair used in the polybezier. Example quad01 shows some simple uses of quadratic Bézier commands within a path. Note that the control point for the "T" command is computed automatically as the reflection of the control point for the previous "Q" command relative to the start point of the "T" command. <rect x="1" y="1" width="1198" height="598"
<path d="M200,300 Q400,50 600,300 T1000,300"
a (relative) elliptical arc (rx ry x-axis-rotation large-arc-flag sweep-flag x y)+ Draws an elliptical arc from the current point to (x, y). The size and orientation of the ellipse are defined by two radii (rx, ry) and an x-axis-rotation, which indicates how the ellipse as a whole is rotated relative to the current coordinate system. The center (cx, cy) of the ellipse is calculated automatically to satisfy the constraints imposed by the other parameters. large-arc-flag and sweep-flag contribute to the automatic calculations and help determine how the arc is drawn. Example arcs01 shows some simple uses of arc commands within a path. <path d="M300,200 h-150 a150,150 0 1,0 150,-150 z"
<path d="M275,175 v-150 a150,150 0 0,0 -150,150 z"
a25,100 -30 0,1 50,-25 l 50,-25"
the x-axis of the ellipse is rotated by x-axis-rotation relative to the x-axis of the current coordinate system. 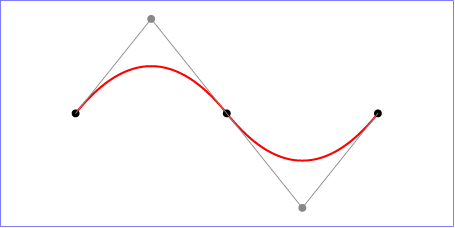 If sweep-flag is '1', then the arc will be drawn in a "positive-angle" direction (i.e., the ellipse formula x=cx+rx*cos(theta) and y=cy+ry*sin(theta) is evaluated such that theta starts at an angle corresponding to the current point and increases positively until the arc reaches (x,y)). A value of 0 causes the arc to be drawn in a "negative-angle" direction (i.e., theta starts at an angle value corresponding to the current point and decreases until the arc reaches (x,y)). <path d="M 125,75 a100,50 0 ?,? 100,50"
where "?,?" is replaced by "0,0" "0,1" "1,0" and "1,1" to generate the four possible cases. Refer to Elliptical arc implementation notes for detailed implementation notes for the path data elliptical arc commands. The following is the BNF for SVG paths. The processing of the BNF must consume as much of a given BNF production as possible, stopping at the point when a character is encountered which no longer satisfies the production. Thus, in the string "M 100-200", the first coordinate for the "moveto" consumes the characters "100" and stops upon encountering the minus sign because the minus sign cannot follow a digit in the production of a "coordinate". The result is that the first coordinate will be "100" and the second coordinate will be "-200". Similarly, for the string "M 0.6.5", the first coordinate of the "moveto" consumes the characters "0.6" and stops upon encountering the second decimal point because the production of a "coordinate" only allows one decimal point. The result is that the first coordinate will be "0.6" and the second coordinate will be ".5". Various operations, including text on a path and motion animation and various stroke operations, require that the user agent compute the distance along the geometry of a graphics element, such as a 'path'. Exact mathematics exist for computing distance along a path, but the formulas are highly complex and require substantial computation. It is recommended that authoring products and user agents employ algorithms that produce as precise results as possible; however, to accommodate implementation differences and to help distance calculations produce results that approximate author intent, the pathLength attribute can be used to provide the author's computation of the total length of the path so that the user agent can scale distance-along-a-path computations by the ratio of pathLength to the user agent's own computed value for total path length. A "moveto" operation within a 'path' element is defined to have zero length. Only the various "lineto", "curveto" and "arcto" commands contribute to path length calculations. The following interfaces are defined below: SVGPathSeg, SVGPathSegClosePath, SVGPathSegMovetoAbs, SVGPathSegMovetoRel, SVGPathSegLinetoAbs, SVGPathSegLinetoRel, SVGPathSegCurvetoCubicAbs, SVGPathSegCurvetoCubicRel, SVGPathSegCurvetoQuadraticAbs, SVGPathSegCurvetoQuadraticRel, SVGPathSegArcAbs, SVGPathSegArcRel, SVGPathSegLinetoHorizontalAbs, SVGPathSegLinetoHorizontalRel, SVGPathSegLinetoVerticalAbs, SVGPathSegLinetoVerticalRel, SVGPathSegCurvetoCubicSmoothAbs, SVGPathSegCurvetoCubicSmoothRel, SVGPathSegCurvetoQuadraticSmoothAbs, SVGPathSegCurvetoQuadraticSmoothRel, SVGPathSegList, SVGAnimatedPathData, SVGPathElement. The SVGPathSeg interface is a base interface that corresponds to a single command within a path data specification. PATHSEG_UNKNOWN The unit type is not one of predefined types. It is invalid to attempt to define a new value of this type or to attempt to switch an existing value to this type. PATHSEG_CLOSEPATH Corresponds to a "closepath" (z) path data command. PATHSEG_MOVETO_ABS Corresponds to an "absolute moveto" (M) path data command. PATHSEG_MOVETO_REL Corresponds to a "relative moveto" (m) path data command. PATHSEG_LINETO_ABS Corresponds to an "absolute lineto" (L) path data command. PATHSEG_LINETO_REL Corresponds to a "relative lineto" (l) path data command. PATHSEG_CURVETO_CUBIC_ABS Corresponds to an "absolute cubic Bezier curveto" (C) path data command. PATHSEG_CURVETO_CUBIC_REL Corresponds to a "relative cubic Bezier curveto" (c) path data command. PATHSEG_CURVETO_QUADRATIC_ABS Corresponds to an "absolute quadratic Bezier curveto" (Q) path data command. PATHSEG_CURVETO_QUADRATIC_REL Corresponds to a "relative quadratic Bezier curveto" (q) path data command. PATHSEG_ARC_ABS Corresponds to an "absolute arcto" (A) path data command. PATHSEG_ARC_REL Corresponds to a "relative arcto" (a) path data command. PATHSEG_LINETO_HORIZONTAL_ABS Corresponds to an "absolute horizontal lineto" (H) path data command. PATHSEG_LINETO_HORIZONTAL_REL Corresponds to a "relative horizontal lineto" (h) path data command. PATHSEG_LINETO_VERTICAL_ABS Corresponds to an "absolute vertical lineto" (V) path data command. PATHSEG_LINETO_VERTICAL_REL Corresponds to a "relative vertical lineto" (v) path data command. PATHSEG_CURVETO_CUBIC_SMOOTH_ABS Corresponds to an "absolute smooth cubic curveto" (S) path data command. PATHSEG_CURVETO_CUBIC_SMOOTH_REL Corresponds to a "relative smooth cubic curveto" (s) path data command. PATHSEG_CURVETO_QUADRATIC_SMOOTH_ABS Corresponds to an "absolute smooth quadratic curveto" (T) path data command. PATHSEG_CURVETO_QUADRATIC_SMOOTH_REL Corresponds to a "relative smooth quadratic curveto" (t) path data command. The type of the path segment as specified by one of the constants specified above. The type of the path segment, specified by the corresponding one character command name. The SVGPathSegClosePath interface corresponds to a "closepath" (z) path data command. The SVGPathSegMovetoAbs interface corresponds to an "absolute moveto" (M) path data command. The absolute X coordinate for the end point of this path segment. NO_MODIFICATION_ALLOWED_ERR: Raised on an attempt to change the value of a readonly attribute. The absolute Y coordinate for the end point of this path segment. The SVGPathSegMovetoRel interface corresponds to an "relative moveto" (m) path data command. The relative X coordinate for the end point of this path segment. The relative Y coordinate for the end point of this path segment. The SVGPathSegLinetoAbs interface corresponds to an "absolute lineto" (L) path data command. The SVGPathSegLinetoRel interface corresponds to an "relative lineto" (l) path data command. The SVGPathSegCurvetoCubicAbs interface corresponds to an "absolute cubic Bezier curveto" (C) path data command. The absolute X coordinate for the first control point. The absolute Y coordinate for the first control point. The absolute X coordinate for the second control point. The absolute Y coordinate for the second control point. The SVGPathSegCurvetoCubicRel interface corresponds to a "relative cubic Bezier curveto" (c) path data command. The relative X coordinate for the first control point. The relative Y coordinate for the first control point. The relative X coordinate for the second control point. The relative Y coordinate for the second control point. The SVGPathSegCurvetoQuadraticAbs interface corresponds to an "absolute quadratic Bezier curveto" (Q) path data command. The absolute X coordinate for the control point. The absolute Y coordinate for the control point. The SVGPathSegCurvetoQuadraticRel interface corresponds to a "relative quadratic Bezier curveto" (q) path data command. The relative X coordinate for the control point. The relative Y coordinate for the control point. The SVGPathSegArcAbs interface corresponds to an "absolute arcto" (A) path data command. The x-axis radius for the ellipse (i.e., r1). The y-axis radius for the ellipse (i.e., r2). The rotation angle in degrees for the ellipse's x-axis relative to the x-axis of the user coordinate system. The value of the large-arc-flag parameter. The value of the sweep-flag parameter. The SVGPathSegArcRel interface corresponds to a "relative arcto" (a) path data command. The SVGPathSegLinetoHorizontalAbs interface corresponds to an "absolute horizontal lineto" (H) path data command. The SVGPathSegLinetoHorizontalRel interface corresponds to a "relative horizontal lineto" (h) path data command. The SVGPathSegLinetoVerticalAbs interface corresponds to an "absolute vertical lineto" (V) path data command. The SVGPathSegLinetoVerticalRel interface corresponds to a "relative vertical lineto" (v) path data command. The SVGPathSegCurvetoCubicSmoothAbs interface corresponds to an "absolute smooth cubic curveto" (S) path data command. The SVGPathSegCurvetoCubicSmoothRel interface corresponds to a "relative smooth cubic curveto" (s) path data command. The SVGPathSegCurvetoQuadraticSmoothAbs interface corresponds to an "absolute smooth quadratic curveto" (T) path data command. The SVGPathSegCurvetoQuadraticSmoothRel interface corresponds to a "relative smooth quadratic curveto" (t) path data command. This interface defines a list of SVGPathSeg objects. SVGPathSegList has the same attributes and methods as other SVGxxxList interfaces. Implementers may consider using a single base class to implement the various SVGxxxList interfaces. The number of items in the list. NO_MODIFICATION_ALLOWED_ERR: Raised when the list cannot be modified. Clears all existing current items from the list and re-initializes the list to hold the single item specified by the parameter. in SVGPathSeg newItem The item which should become the only member of the list. SVGPathSeg The item being inserted into the list. SVG_WRONG_TYPE_ERR: Raised if parameter newItem is the wrong type of object for the given list. Returns the specified item from the list. in unsigned long index The index of the item from the list which is to be returned. The first item is number 0. INDEX_SIZE_ERR: Raised if the index number is negative or greater than or equal to numberOfItems. Inserts a new item into the list at the specified position. The first item is number 0. If newItem is already in a list, it is removed from its previous list before it is inserted into this list. in SVGPathSeg newItem The item which is to be inserted into the list. in unsigned long index The index of the item before which the new item is to be inserted. The first item is number 0. If the index is less than or equal to 0, then the new item is inserted at the front of the list. If the index is greater than or equal to numberOfItems, then the new item is appended to the end of the list. Replaces an existing item in the list with a new item. If newItem is already in a list, it is removed from its previous list before it is inserted into this list. in unsigned long index The index of the item which is to be replaced. The first item is number 0.
in unsigned long index The index of the item which is to be removed. The first item is number 0. Inserts a new item at the end of the list. If newItem is already in a list, it is removed from its previous list before it is inserted into this list. in SVGPathSeg newItem The item which is to be inserted into the list. The first item is number 0. The SVGAnimatedPathData interface supports elements which have a 'd' attribute which holds SVG path data, and supports the ability to animate that attribute. DOM attribute pathSegList provides access to the static/base contents of the d attribute in a form which matches one-for-one with SVG's syntax. DOM attribute normalizedPathSegList provides normalized access to the static/base contents of the d attribute where all path data commands are expressed in terms of the following subset of SVGPathSeg types: SVG_PATHSEG_MOVETO_ABS (M), SVG_PATHSEG_LINETO_ABS (L), SVG_PATHSEG_CURVETO_CUBIC_ABS (C) and SVG_PATHSEG_CLOSEPATH (z). DOM attribute animatedPathSegList provides access to the current animated contents of the d attribute in a form which matches one-for-one with SVG's syntax. DOM attribute animatedNormalizedPathSegList provides normalized access to the current animated contents of the d attribute where all path data commands are expressed in terms of the following subset of SVGPathSeg types: SVG_PATHSEG_MOVETO_ABS (M), SVG_PATHSEG_LINETO_ABS (L), SVG_PATHSEG_CURVETO_CUBIC_ABS (C) and SVG_PATHSEG_CLOSEPATH (z). Each of the two lists are always kept synchronized. Modifications to one list will immediately cause the corresponding list to be modified. Modifications to normalizedPathSegList might cause entries in pathSegList to be broken into a set of normalized path segments. Additionally, the 'd' attribute on the 'path' element accessed via the XML DOM (e.g., using the getAttribute() method call) will reflect any changes made to pathSegList or normalizedPathSegList. Provides access to the base (i.e., static) contents of the d attribute in a form which matches one-for-one with SVG's syntax. Thus, if the d attribute has an "absolute moveto (M)" and an "absolute arcto (A)" command, then pathSegList will have two entries: a SVG_PATHSEG_MOVETO_ABS and a SVG_PATHSEG_ARC_ABS. Provides access to the base (i.e., static) contents of the d attribute in a form where all path data commands are expressed in terms of the following subset of SVGPathSeg types: SVG_PATHSEG_MOVETO_ABS (M), SVG_PATHSEG_LINETO_ABS (L), SVG_PATHSEG_CURVETO_CUBIC_ABS (C) and SVG_PATHSEG_CLOSEPATH (z). Thus, if the d attribute has an "absolute moveto (M)" and an "absolute arcto (A)" command, then pathSegList will have one SVG_PATHSEG_MOVETO_ABS entry followed by a series of SVG_PATHSEG_ARC_ABS entries which approximate the arc. This alternate representation is available to provide a simpler interface to developers who would benefit from a more limited set of commands. The only valid SVGPathSeg types are SVG_PATHSEG_MOVETO_ABS (M), SVG_PATHSEG_LINETO_ABS (L), SVG_PATHSEG_CURVETO_CUBIC_ABS (C) and SVG_PATHSEG_CLOSEPATH (z). Provides access to the current animated contents of the d attribute in a form which matches one-for-one with SVG's syntax. If the given attribute or property is being animated, contains the current animated value of the attribute or property, and both the object itself and its contents are readonly. If the given attribute or property is not currently being animated, contains the same value as 'baseVal'. NO_MODIFICATION_ALLOWED_ERR: Raised on an attempt to modify the contents of the object referenced by the attribute. Provides access to the current animated contents of the d attribute in a form where all path data commands are expressed in terms of the following subset of SVGPathSeg types: SVG_PATHSEG_MOVETO_ABS (M), SVG_PATHSEG_LINETO_ABS (L), SVG_PATHSEG_CURVETO_CUBIC_ABS (C) and SVG_PATHSEG_CLOSEPATH (z). If the given attribute or property is being animated, contains the current animated value of the attribute or property, and both the object itself and its contents are readonly. If the given attribute or property is not currently being animated, contains the same value as 'baseVal'. The SVGPathElement interface corresponds to the 'path' element. Corresponds to attribute pathLength on the given 'path' element. Returns the user agent's computed value for the total length of the path using the user agent's distance-along-a-path algorithm, as a distance in the current user coordinate system. float The total length of the path. Returns the (x,y) coordinate in user space which is distance units along the path, utilizing the user agent's distance-along-a-path algorithm. in float distance The distance along the path, relative to the start of the path, as a distance in the current user coordinate system. SVGPoint The returned point in user space. Returns the index into pathSegList which is distance units along the path, utilizing the user agent's distance-along-a-path algorithm. unsigned long The index of the path segment, where the first path segment is number 0. Returns a stand-alone, parentless SVGPathSegClosePath object. SVGPathSegClosePath A stand-alone, parentless SVGPathSegClosePath object. Returns a stand-alone, parentless SVGPathSegMovetoAbs object. in float x The absolute X coordinate for the end point of this path segment. in float y The absolute Y coordinate for the end point of this path segment. SVGPathSegMovetoAbs A stand-alone, parentless SVGPathSegMovetoAbs object. Returns a stand-alone, parentless SVGPathSegMovetoRel object. in float x The relative X coordinate for the end point of this path segment. in float y The relative Y coordinate for the end point of this path segment. SVGPathSegMovetoRel A stand-alone, parentless SVGPathSegMovetoRel object. Returns a stand-alone, parentless SVGPathSegLinetoAbs object. SVGPathSegLinetoAbs A stand-alone, parentless SVGPathSegLinetoAbs object. Returns a stand-alone, parentless SVGPathSegLinetoRel object. SVGPathSegLinetoRel A stand-alone, parentless SVGPathSegLinetoRel object. Returns a stand-alone, parentless SVGPathSegCurvetoCubicAbs object. in float x1 The absolute X coordinate for the first control point. in float y1 The absolute Y coordinate for the first control point. in float x2 The absolute X coordinate for the second control point. in float y2 The absolute Y coordinate for the second control point. SVGPathSegCurvetoCubicAbs A stand-alone, parentless SVGPathSegCurvetoCubicAbs object. Returns a stand-alone, parentless SVGPathSegCurvetoCubicRel object. in float x1 The relative X coordinate for the first control point. in float y1 The relative Y coordinate for the first control point. in float x2 The relative X coordinate for the second control point. in float y2 The relative Y coordinate for the second control point. SVGPathSegCurvetoCubicRel A stand-alone, parentless SVGPathSegCurvetoCubicRel object. Returns a stand-alone, parentless SVGPathSegCurvetoQuadraticAbs object. in float x1 The absolute X coordinate for the control point. in float y1 The absolute Y coordinate for the control point. SVGPathSegCurvetoQuadraticAbs A stand-alone, parentless SVGPathSegCurvetoQuadraticAbs object. Returns a stand-alone, parentless SVGPathSegCurvetoQuadraticRel object. in float x1 The relative X coordinate for the control point. in float y1 The relative Y coordinate for the control point. SVGPathSegCurvetoQuadraticRel A stand-alone, parentless SVGPathSegCurvetoQuadraticRel object. Returns a stand-alone, parentless SVGPathSegArcAbs object. in float r1 The x-axis radius for the ellipse (i.e., r1). in float r2 The y-axis radius for the ellipse (i.e., r2). in float angle The rotation angle in degrees for the ellipse's x-axis relative to the x-axis of the user coordinate system. in boolean largeArcFlag The value for the large-arc-flag parameter. in boolean sweepFlag The value for the sweep-flag parameter. SVGPathSegArcAbs A stand-alone, parentless SVGPathSegArcAbs object. Returns a stand-alone, parentless SVGPathSegArcRel object. SVGPathSegArcRel A stand-alone, parentless SVGPathSegArcRel object. Returns a stand-alone, parentless SVGPathSegLinetoHorizontalAbs object. SVGPathSegLinetoHorizontalAbs A stand-alone, parentless SVGPathSegLinetoHorizontalAbs object. Returns a stand-alone, parentless SVGPathSegLinetoHorizontalRel object. SVGPathSegLinetoHorizontalRel A stand-alone, parentless SVGPathSegLinetoHorizontalRel object. Returns a stand-alone, parentless SVGPathSegLinetoVerticalAbs object. SVGPathSegLinetoVerticalAbs A stand-alone, parentless SVGPathSegLinetoVerticalAbs object. Returns a stand-alone, parentless SVGPathSegLinetoVerticalRel object. SVGPathSegLinetoVerticalRel A stand-alone, parentless SVGPathSegLinetoVerticalRel object. Returns a stand-alone, parentless SVGPathSegCurvetoCubicSmoothAbs object. SVGPathSegCurvetoCubicSmoothAbs A stand-alone, parentless SVGPathSegCurvetoCubicSmoothAbs object. Returns a stand-alone, parentless SVGPathSegCurvetoCubicSmoothRel object. SVGPathSegCurvetoCubicSmoothRel A stand-alone, parentless SVGPathSegCurvetoCubicSmoothRel object. Returns a stand-alone, parentless SVGPathSegCurvetoQuadraticSmoothAbs object. SVGPathSegCurvetoQuadraticSmoothAbs A stand-alone, parentless SVGPathSegCurvetoQuadraticSmoothAbs object. Returns a stand-alone, parentless SVGPathSegCurvetoQuadraticSmoothRel object. SVGPathSegCurvetoQuadraticSmoothRel A stand-alone, parentless SVGPathSegCurvetoQuadraticSmoothRel object.